Georgina Sweet (1875 – 1946) was an academic in the fields of zoology and parasitology at the University of Melbourne. She was an early pioneer of women in science and was appointed the University’s first woman lecturer in 1901. In 2010, the Australian Research Council (ARC) recognized Georgina’s contribution to science by naming a new laureate fellowship after her. The Georgina Sweet Australian Laureate Fellowship was created to try to address the low number of female laureate applicants. It provides additional funding for the recipient to be an Ambassador to promote women in scientific research. I was honoured to receive the Georgina Sweet Australian Laureate Fellowship in 2015 and since then, I’ve been working to establish a number of initiatives to promote women in science. One of these is the Georgina Sweet Award for Women in Quantitative Biomedical Science. These new awards of $25,000 each were awarded for the first time this year to Associate Professor Alicia Oshlack, Head of Bioinformatics at the Murdoch Childrens Research Institute; Associate Professor Kathryn Holt Head of Microbial Genomics at the University of Melbourne, and; Associate Professor Freya Fowkes, Head of Malaria and Infectious Disease Epidemiology at the Burnet Institute. To celebrate the success of these impressive researchers, around 70 people joined us for the award event held at the Bio21 Institute at the University of Melbourne on 27 October, 2016. After hearing from the winners about their research, there was a lively discussion about women in leadership and science, followed by networking over a glass of wine. We were pleased to be able to showcase three portraits of Georgina Sweet by Melbourne artist, Deirdre Walsh, at the event. 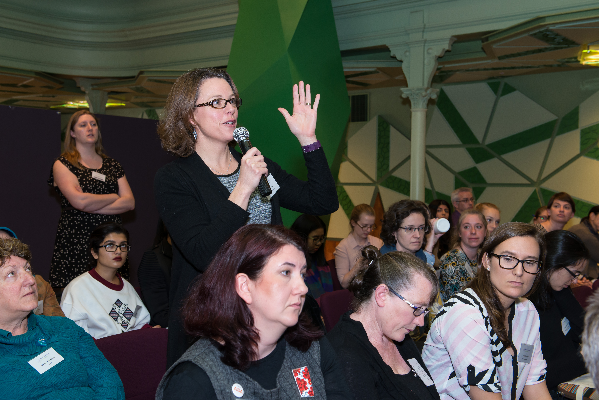 Members of the Award Panel were very impressed by the number and quality of applications for these awards, and we look forward to hearing from some more exceptional women researchers for next year’s awards. I am currently working to try to increase the number of female speakers at scientific conferences by establishing the Georgina Sweet Travel Support Awards for women to present a Keynote in quantitative biomedical science. In addition to these awards, I have established a list of high profile women researchers in quantitative biomedical science that is available on the web for conference organisers to use. To find out more about my work to promote women in science, see: Georgina Sweet Laureate Fellowship. I believe that discovery science needs the collective intelligence that arises from integrating diverse inputs from people with different ideas and different perspectives. We need passionate women to help drive collaborative efforts to find solutions to important problems. Leann Tilley is Redmond Barry Distinguished Professor of Biochemistry and Molecular Biology at the University of Melbourne, and an Associate Director of the Bio21 Molecular Science and Biotechnology Institute. In 2015, Leann was awarded the Georgina Sweet Australian Laureate Fellowship which includes a role as an ambassador for women in science. The Fellowship recognizes her world leading research on malaria pathogenesis and drug resistance and. Leann is working to bring imaging, biology and computational science disciplines together in a convergence approach to study the malaria parasite. Her work has been recognised by the award of the Bancroft-Mackerras Medal from the Australian Society for Parasitology (2010), by the Beckman Coulter Discovery Award of the Australian Society for Biochemistry and Molecular Biology (2011) and by the 2016 Eureka Prize for Infectious Diseases Research. She is President-elect of the Australian Society for Biochemistry and Molecular Biology.